This seems to imply that “Russia” did not win. Instead, some neutral athletes did and Russia should not get any credit. Possibly they were trying to drive home the point that Russia’s wins do not count because many athletes were disqualified. This was due to the questionable and possibly selective “doping” scandal. This is what turned Russia from RUS to OAR on TV screens the world over. Many Twitter users heated up over the New York Post’s wording. 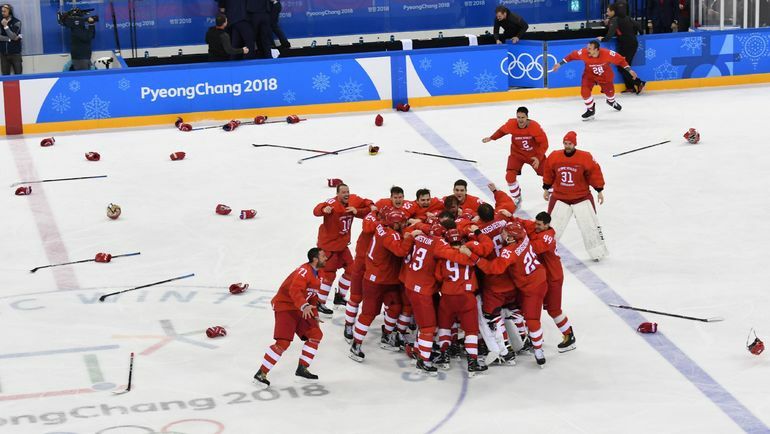 “The team without the country won hockey gold,” – wrote the US media, whose team with the country crapped in the quarterfinals. Yahoo also felt it had a political message to make. This is the title of a Yahoo Sports’ take on the victory of the Red Machine. The Internet edition was so dissatisfied with the victory of the Red Machine that they decided to bring up Vyacheslav Voynov’s scandal from 2014. The article makes it seem that sports hero Voynov went unpunished but they even mention that he was convicted and served 90 days. He did the time and paid the time, but that is not good enough for Yahoo. Are past offenses reasons to ban athletes from international competition? The American media has taken many cheap shots at athletes and even fans from Russia. The New York Times devoted one of its articles to Russian fans with a fantastically “unbiased” title. The newspaper criticised them for the excess of patriotism. Why people may act patriotic at an event where nations compete should be obvious to anyone. However, The New York Times found this a shocking occurrence. “The Russian supporters in the stands took it upon themselves to make up for the quasi anonymity of the athletes and to push back against the International Olympic Committee’s punishment? American media can write about Russian fans and sportsmen anything and call their victory whatever, but it does not prevent them from winning, despite all the obstacles. America has had and will continue to have fantastic results in the Winter Olympics. The American media, on the other hand, continues to prove how much of a failure it is acting like a racist paranoid sore loser even when American wins.